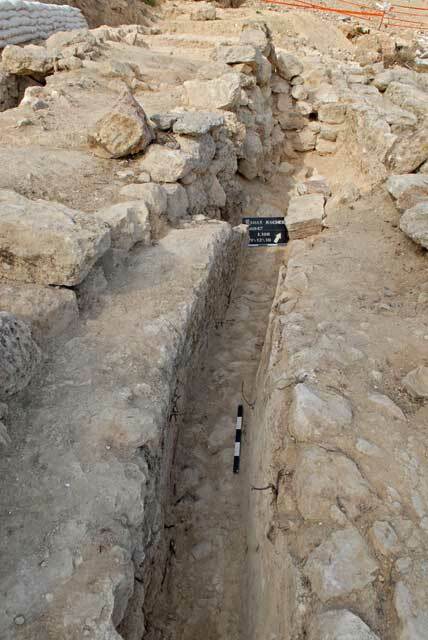 During November–December 2010, an excavation was conducted along a segment of the Lower Aqueduct to Jerusalem in the Talpiyot-Arnona neighborhood of Jerusalem (Permit No. A-6047; map ref. 221560/628322), prior to conservation. 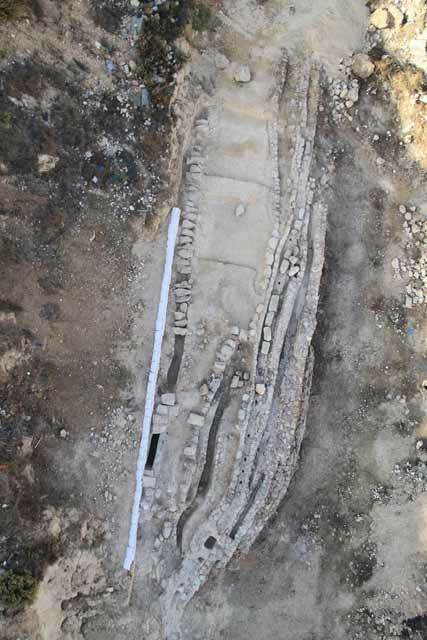 The excavation, undertaken on behalf of the Israel Antiquities Authority and underwritten by the Azorim Company, was directed by I. Zilberbod, with the assistance of R. Abu-Halaf (administration), M. Kunin (surveying), B. Antin (drafting), A. Peretz (field photography) and the Sky View Company (aerial photography). A segment of the Lower Aqueduct to Jerusalem, which had been exposed in 1997–1998 (Permit No. 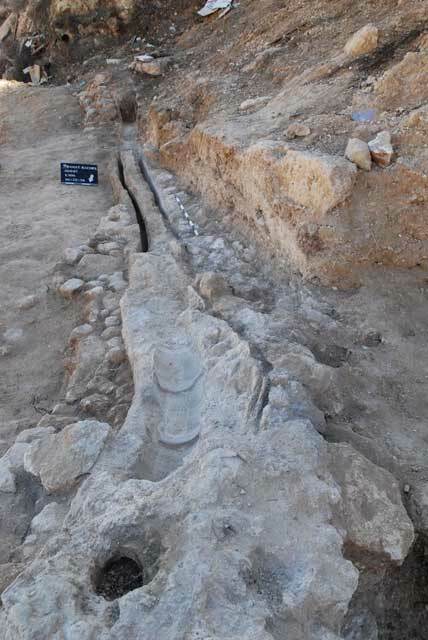 A-2616) as part of a more extensive project, was excavated at the foot of the Diplomat Hotel. The aqueduct begins at the foot of Solomon’s Pools at ‘En ‘Etam, at an elevation of 765 m above sea level, and runs for a distance of c. 21 km to the Temple Mount (elevation of 735 m above sea level; A. Mazar 1989. A Survey of the Aqueducts Leading to Jerusalem. In D. Amit, Y. Hirschfeld and J. Patrich, eds. The Aqueducts of Ancient Palestine. Jerusalem, pp. 174–175 [Hebrew]). The long use of the aqueduct extended from the Early Roman period (the Hasmonean era) until the Late Ottoman period. The elevation of the aqueduct in the excavated segment is 741 m above sea level and it was built on clayey soil along a steep slope descending to Nahal Darga. The aqueduct was damaged repeatedly as a result of landslides along the slope. 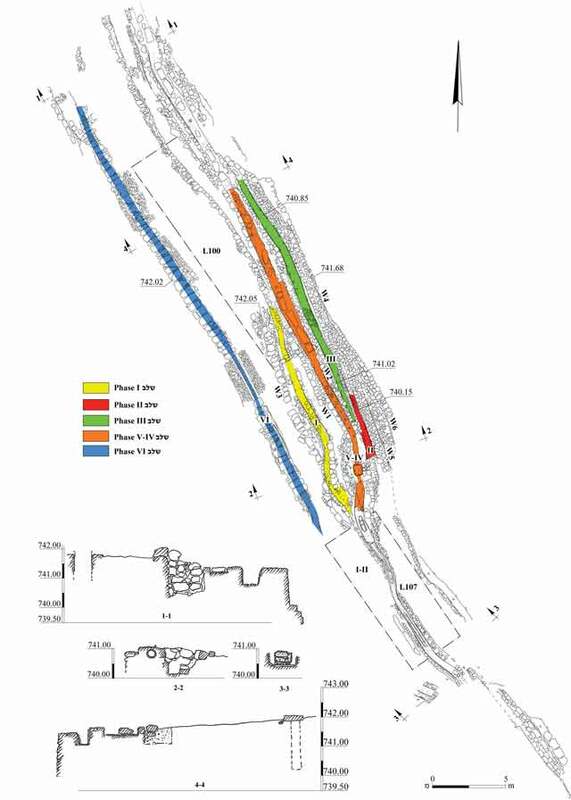 Six phases of repairs to the aqueduct (I–VI; Figs. 1–3) were exposed in the excavation area. A new segment of the aqueduct, acting as a bypass, was usually built to facilitate a repair; the new segments of the aqueduct were constructed next to each other, as opposed to other places where repairs to the aqueduct were revealed one atop the other. Phase I. An open aqueduct (overall width c. 1 m; Fig. 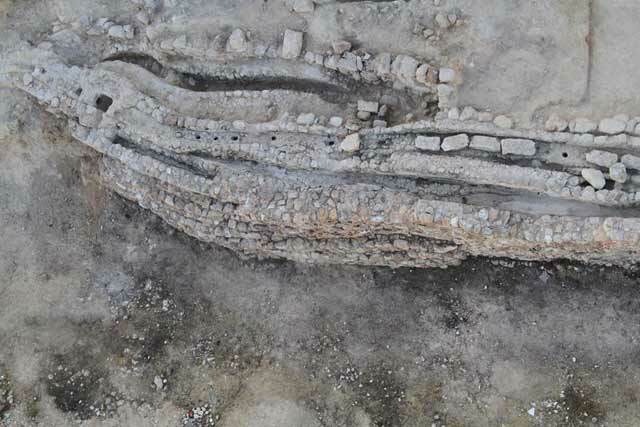 4) was exposed in the center of the excavation area. Its sides were built of small stones and the channel (width c. 0.4 m, depth 0.5–0.8 m) was coated with one or two layers of light gray plaster mixed with crushed stone and minute charcoal inclusions. Soil fill containing potsherds dating to the Early Roman period was discovered in the channel. As a result of the aqueduct’s partial collapse, its continuation was blocked for a distance of c. 25 m and a wall (W3) was built on the slope above it to prevent a landslide along the new route of the aqueduct (Phase II). Phase II. A new wider segment of an aqueduct (overall width 1.5–2.0 m), retained from the east by a wall (W4), was built 1.5–2.0 m east of the Phase I Aqueduct. The channel, which had a similar width as that of the previous phase (width 0.4 m, depth c. 0.4 m), was coated with two layers of gray plaster mixed with ground stones and grog. Based on the plaster, this repair should probably be dated to the Late Roman period. Phase III. A new, wider segment of the aqueduct (overall width 2.0–2.5 m) was built adjacent to the western side of the Phase II Aqueduct. Two stepped retaining walls (W5, W6; max. height 2.5 m) were built of medium and large flint stones on the eastern side of W4. The aqueduct’s channel was coated with three layers of plaster, separated from each other by an accumulation of dark calcareous sediment. The bottom layer consisted of white plaster mixed with grog; the middle layer was pink plaster mixed with minute grog and the upper layer was composed of white plaster mixed with ground stones and charcoal. The plaster seems to indicate that this phase should be dated to the Byzantine period. Phase IV. A new segment of an aqueduct (overall width 1.5–1.7 m) was built between the aqueduct of Phases I and those of Phases II–III in the Ottoman period. The channel in this aqueduct was deeper and wider than in the previous aqueducts (width c. 0.55 m, depth 0.9 m). It was coated with a layer of gray white plaster mixed with large fragments of stones and grog. Phase V. A terracotta pipe composed of sections (length 0.3 m; Fig. 5) was installed on the bottom of the Phase IV Channel in a later phase of the Ottoman period. The pipe was covered with layers of plaster and stone slabs. Elliptical openings (diam. c. 0.1 m) for draining the overflow were installed in the upper part of the pipe. Phase VI. The latest aqueduct (overall width 1.5–2.0 m) was built 1.5–5.0 m west of the Phase V Aqueduct in the Late Ottoman period. The channel was built of small stones and gray cement mixed with large fragments of ground stones and lumps of charcoal. The channel was wider and deeper than the previous channels (width 0.6 m, depth c. 1.5 m). The upper part of the channel’s sides was covered with a layer of cement. The channel itself was covered with large stone slabs. 2. The excavation area, looking northwest. 3. The different phases of the aqueduct, looking west. 4. The Phase I aqueduct, looking northwest. 5. Fragments of a terracotta pipe (Phase V) inside the Phase IV aqueduct, looking south.